(High-Decorative) This absolutely delightful Caucasian Gendje rug amply possesses the lively color and crisply organized, dazzling geometry beloved in this prized subgroup. Within the classic Gendje diagonal field thought to convey sloping mountainsides, an entirely unexpected assortment of archetypal birds, blossoming flowers, and individual gazelles (or are they horses?) are whimsically rendered. Sapphire blue, goldenrod and jade green communicate a great joie de vivre, natural accompaniments to these whimsical folk art images. 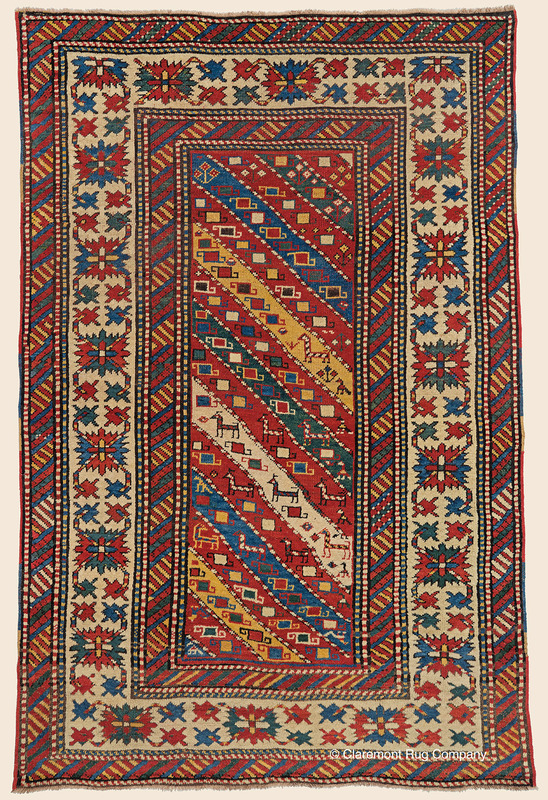 Happily, this superbly crafted rug has been hardy used and remains in heavy pile condition.